The new Brooklyn Studios for Dance. Photo by Pepper Fajans. Five years ago, the contemporary dance community in New York City probably did not look much different from today. At least, that’s what I thought as I started to write this article. How much can change in five years? It is a short amount of time, by most accounts, and it is doubtful any revolutionary shifts have taken place. But, the more I thought about it, the more it became clear that the past five years have been defined more by radical shifts than by any kind of stasis. Five years ago, the field was still experiencing a mourning period from the previous summer that saw deaths of modern dance visionaries Merce Cunningham and Pina Bausch. There was a post-recession malaise that would continue to spread over the next few years, with funding sources precarious as ever. What soon followed displayed a field in an ever-delicate state; the fiscally hopeful merging of Dance Theater Workshop and Bill T Jones/Arnie Zane Dance Company to New York Live Arts, the sad dissolution of Dance New Amsterdam, and, more recently, the sudden collapse of Cedar Lake Contemporary Ballet and the abrupt truncating of Time Out New York’s Dance section as Gia Kourlas resigns as Editor. To be fair, the past five years in dance are not solely marked by death and disappearance. It also saw the emergence of some new, formidable spaces for dance: Brooklyn Academy of Music’s Fishman Space, JACK, Gallim Dance inside the Church of St. Luke and St. Matthew, and the recent occupation of the former home of Dance New Amsterdam by Gibney Dance. No matter how you spin it, this is a field indebted to space; places we can perform, take class, audition, socialize, complain, stretch out, sip our coffees and check our e-mail when we should be warming up for rehearsal. Dance relies on the existence of these spaces. The field can only sustain itself as long as it has places to do so. It is a windy Sunday evening in April and we are sitting in what is to be Brooklyn Studios for Dance (BKSD), a part of Cadman Memorial Congregational Church in Clinton Hill, Brooklyn. He is recounting how this search for a multi-use space started five years ago, but how his interest stemmed from his upbringing. All the while, he is gazing out into the vast room and its 23-foot-ceilings, undoubtedly admiring the work he and so many others have put in to the budding space already. “I knew this is what I could contribute the most to [in the dance community]. I have criticisms of spaces but I don’t hold them at fault,” he says, noting in jest that a “column-free” studio is something of a luxury to the dance field in NYC. I sigh. He has a point. In 2013, a chance set up through the New York Landmarks Conservancy introduced Fajans to the congregation at Cadman and catalyzed his plans. Susan Pierce, Cadman’s Chair and a member of the congregation for twenty-five years, recalls Fajans approaching the space with an idea of how to reshape it in a way that would not disturb its current infrastructure. 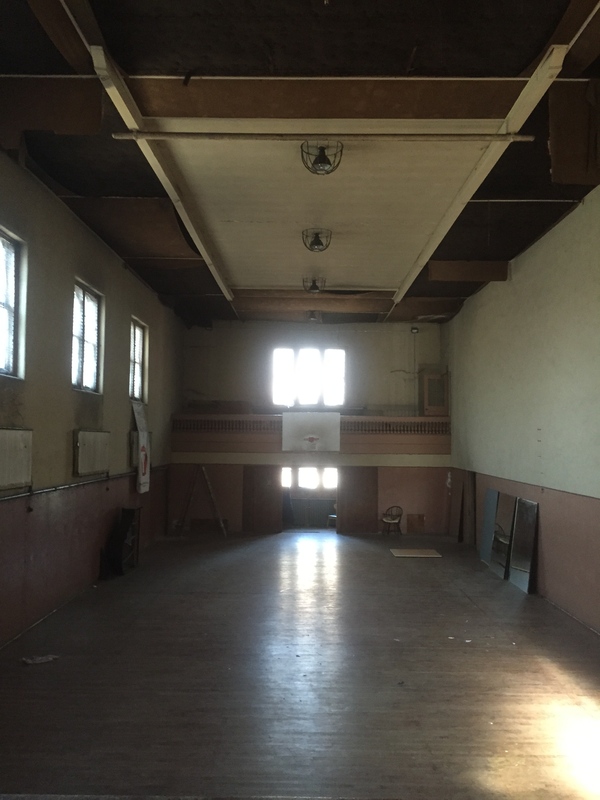 At that time, another dance company had approached the church but their plans “required too many upgrades [and] too much renovation” and the congregation did not approve their proposal. Fajans, with his background, experience, and clear vision, had them convinced. 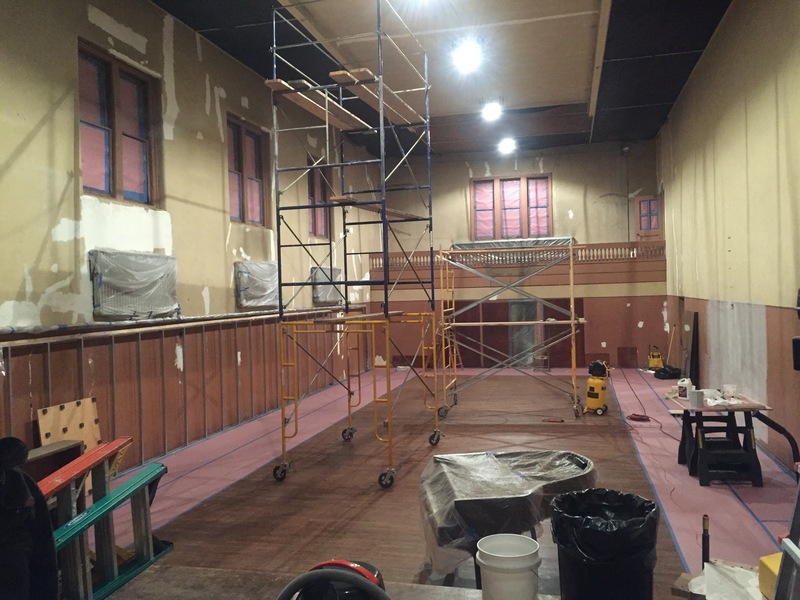 The early stages of renovation at Brooklyn Studios for Dance. Photo by Pepper Fajans. In their early conversations, Fajans’s enthusiastic idealism was met with Tenenbaum’s steady pragmatism. In order for their partnership to work, they had to mitigate their approaches. As they were working toward a shared goal of creating a home for dance, they acknowledged they were coming from different backgrounds and experiences. Tenenbaum has co-organized CLASSCLASSCLASS for a few years, a low-cost program that offers early-career teachers a testing ground for unconventional classes geared toward a movement-interested community. While both agreed holding classes at the space would be a large component of their offerings, it was Tenenbaum’s prior experience in scheduling, organizing, and implementing these classes that drove early conversations. And, though both entered into building BKSD as a partnership, Tenenbaum’s early instincts told her to follow Fajans’s lead. 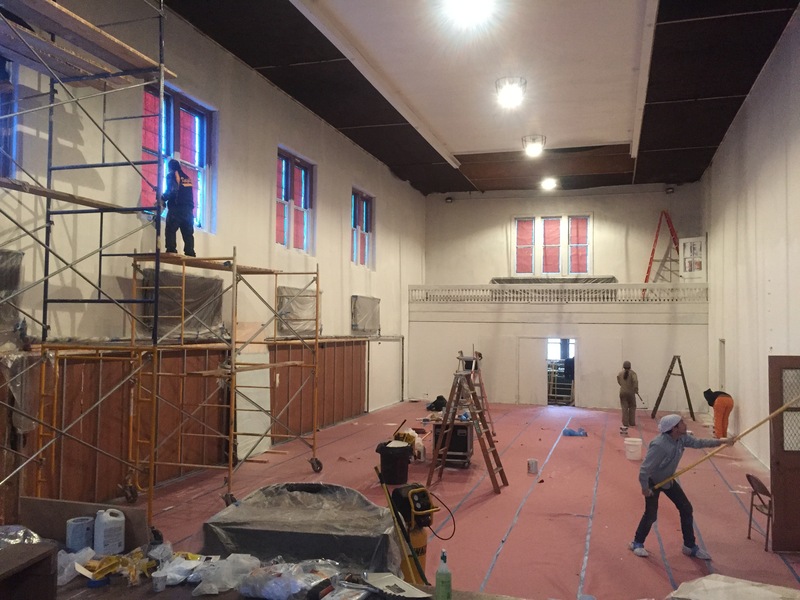 This planning revved into forward motion this past January, when Fajans received the official approval from the church to start renovating the space. 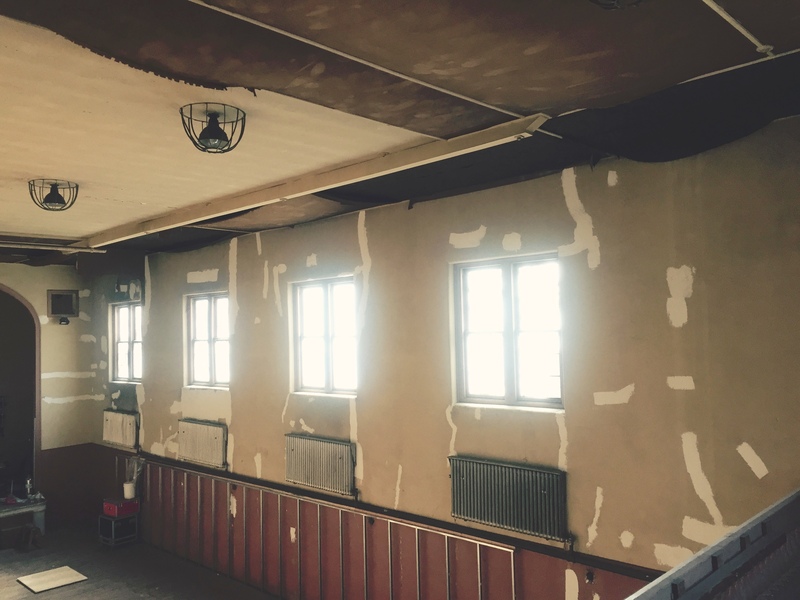 What followed was a host of logistical activities required to create a habitable dance space: painting the walls, installing a new floor and adequate heating system, building a new ceiling, creating a comprehensive website and putting out numerous calls for volunteers. Fajans is earnest in admitting he could have done most of this work himself or with the help of one or two friends, but that was never his plan. With some planning and the omnipresent power of social media, the interest surrounding BKSD grew by the day. This included numerous volunteers who came in at all hours to lend a hand. Many of the messages on social media came from Tenenbaum or Fajans and made clear that any one who showed up would be put to work. BKSD soon had a growing Facebook presence where volunteers could reliably scan the day’s tasks, in addition to viewing its progress through status updates and photos. During this time, the team grew to include dance artists Buck Wanner, Kay Ottinger, Lindsay Reuter and Alice MacDonald. They would take on more of the core responsibilities around programming and organizing. Ottinger, with experience coordinating Movement Research at Judson Church and Open Performance, has organized many of the upcoming performance events for the pilot month. Reuter and MacDonald are both involved with CLASSCLASSCLASS and have played a large part in coordinating the schedule and teachers who will offer free class during this period. Wanner has been an instrumental presence in initial conversations of how the space should be used and was one of the first artists to rehearse there. “This group has a vast range of skills,” MacDonald says, “and our collaborative efforts help bring out what each person really excels at.” Everyone interviewed for this article emphasized over and over the importance of allowing the space to guide these efforts; asking first what it needs rather than imposing any arbitrary agendas or ideas. It is a refreshingly compassionate approach to developing an arts space, especially in a city where the outrageous affluence required to own real estate seems to stand in stark opposition to the necessary adaptability of contemporary dance. Volunteers working in the space, March 2015. Photo by Pepper Fajans. The pilot month will run from April 27th to May 30th. In that time BKSD will host numerous daily classes, weekend workshops, performances and a closing potluck event, with most activities being free of charge. The space will close for most of the summer months so Fajans, Tenenbaum, and the rest of the team can solicit community feedback and renegotiate how the studio will function when it reopens in the fall. With that consideration, the organizers do not view this initial month as a definitive vision for the space but as one possible idea for how it can operate. Much thought has also gone into the evening classes in particular — students can take two 90-minute classes per night. This serves as a two-for-one experience for class takers in addition to eliminating the potential competition for morning class slots, a time period that is very much embedded in the freelance dance community. “It is a landscape I am hypersensitive to,” Tenenbaum adds. “[Freelance dancers] have very heavy morning schedules and their entire economy is based on that.” BKSD is remaining admirably cognizant of the field at large, maintaining the space as a community effort while being sensitive to models that have existed in the dance community for years. BKSD is not only working to address how a community can come together, but how it can work together in building a place to do so. In a field that is in constant need of space and, more importantly, more ways to assemble, congregate, and meet like-minded artists, BKSD seems like a much-needed outlet. It is both a budding institution and a place born of opposition to the institutional standards that can work to silo the very community they want to galvanize. It is a new model, or one of many new models, for a new generation of dance artists. He is still coming off the excitement of the previous day, where an Open House event was one of the first times the space was open to the public. Fajans knows there is work to be done, but he also realizes there is an ever-growing community behind him, ready to get their hands dirty to build something to be proud of. A yet-to-be-painted wall, April 2015. Photo by Pepper Fajans. Brooklyn Studios for Dance’s launch event will take place Monday, April 27th from 7:00pm to 11:00pm. More information, including a full schedule of events, can be found at bksd.org. Tara Sheena is a dancer and writer living in Brooklyn, NY.